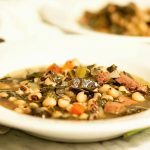 Black Eyed Pea Soup Recipe - This stew is spot on, loaded with kale & black-eyed peas it's full of veggies and is fabulously flavorful. Pick thru the beans, checking for small rocks, blemished beans, etc and remove. Rinse them well. Prepare the beans by following product directions by either soaking the beans overnight or using the quick soak directions. After soaking, pour out the water the beans have been soaking in. Rinse the beans well. If you don't rinse them, the beans will have a black/gray foam on them. Remove the beans from the pot and set aside. In a large stock pot, heat 2 tablespoons olive oil over medium high heat. Add the meat - (turkey leg, ham hock or ham) and the vegetables. It's going to look like there are a ton of vegetables, but it cooks down quickly. Season with black & red pepper, bay leaf and the Italian seasoning. Saute' until tender, about 6-8 minutes. Add the beans back to the pot. Pour in the chicken broth and add enough water to cover the beans. Cover and increase the heat to high and bring to a boil. After it comes to a boil, reduce the heat to medium low and continue to cook on a slow bubble until the beans are tender - about one hour fifteen minutes. Check the beans to see if they are tender after about 60 minutes. it will take 60-90 minutes to cook. Remove the turkey leg or ham hock from the stew. When it is cool enough to handle, carefully remove the meat and add it back to the stew. Lastly, check the seasonings. I added about a teaspoon of salt at this point, maybe a touch more than that, but it really didn't need much considering the volume. Add the salt at the end. If you add it before the beans are cooked, they will get tough. If needed salt the soup at the end. If you add salt during the cooking process the beans/peas get tough. Wait until the end to salt. I added about a teaspoon of salt at the end. Often the salt from the ham, turkey leg or ham bone adds just the right amount of seasoning!